Diversity Management, Diversity Training, Communication, Learning and Team Building and Team Conflict Resolution Specialists. In 2001 Arthie and I met the wonderful Principal of a Charter School in the USA, his name is Ralph Taylor. He called himself the Dean of Dreams. This wonderful man inspired us with his vision to build the dreams of learners, in his school – Times Squared Academy – Providence, RI. Charter schools are private public partnerships to build schools that fit between private and public schools. Interested role-players are asked to create a model of a school that will ensure excellent education opportunities for learners who cannot afford a private education. The Times² Academy started off as a middle school, which focused on engineering, sciences and technology and at risk (under-privileged inner city) children. Very few such youngsters find themselves working in these fields. The United States Department of Education – pays charter schools the normal national fee per child. In 2001 it was US$ 7000. They then monitor the schools to see if they live up to their promises. Ralph Taylor invited us to work and stay with him, when we were in the USA attending an Accelerated Learning course during early 2001. We then created this model and structure for the Dream Dynasty for his school. This is a huge opportunity for schools around the world to completely transform the way in which learning, teachers and learners are focused, and to create safe, future-focused learning environments for all role-players.  The natural joy of life, power and creativity, that many of these young people have – becomes crushed. Step 1 – Get buy-in at all levels, starting with the Principal and the Department of Education. Create the structure. Step 2 – Re-focus all role-players on the Dream. Step 3 – Involve Educators and support team. Step 4 – Involve Learners and Parents. Step 5 – Create a safe, professional, respectful, caring and nurturing learning environment. Step 6 – Build skills, values, trust and self esteem of role players. Step 7 – Build their dreams supported by Dream Circles, sponsors, and voluntary mentors. Step 8 – Maintain the Dream focus. Step 9 – Monitor, assess, guide and motivate. Step 10 – Bring back successful dreamers to share with the new dreamers. When we focus on the dreams we focus an amazing and positive energy everyone on the futures of learners, parents, teachers, support staff and the Dean of Dreams. Our principle focus is on the learners, yet as we go along suddenly people who had fallen into day-to-day survival or success – realize that they too have opportunities and they too have dreams and desires. The Principal. In addition to her normal roles and responsibilities, it is this leader’s role to keep the dreams alive and ensure that the learning environment is safe and uplifting. Then Dean of Dreams will catalyse parents, teachers, the private and public sectors and society at large, to support the experiences and teaching of dream possibilities to all role-players. Without values and experience of possibilities dreams cannot be formed. When we were in RI we asked a group of youngsters what the understood by values – one youngster stood and said, “Wal-Mart, has great value.” There was no idea whatsoever of family or personal values. We asked them to build a model of a mountain. Their creation was a very small hill. Because they had never seen a mountain – they could not create one. Similarly dreams without some prior experience have no foundations, at all. These are the educators/ teachers. They are named as the Dream Keepers of Science/ Geography etc. It is up to them to facilitate learning in such a way that it always points to the value added to the visions of the learners. They too need to deeply know and understand the background to the futures of their learners. They have to act in a manner that is in keeping with the values of the school and the role players. These are the admin team, management team, the canteen staff, security staff and the janitors. Each one has to show their focus on the school, learners and must also to act in a manner that is in keeping with the values of the school and the role players. The parents and care-givers. Building a dream and educating young people requires incredible commitment from them. It is critical that the values of the learners and the school become a part of the home environment. Dream Nurturers need to know and understand the learning styles, personality types and dreams of their children. It is up to them to believe in the youngsters and their dreams. Even when the dream focus is suddenly changed in mid-stream, as it normally will. Their powerful belief and support will ensure their children’s futures. The dream path will vary, as time goes by. The foundations must be laid as early as possible, in the learners’ lives. It is these formative years where simple values need to be built. In our home, we use two. Good and Kind. “Was that good and kind?” is our response to positive or negative behaviour. Through that the child begins to make decisions about his behaviour. This lays the grounding for choice in behaviour, at an early stage. Teachers and parents are responsible of keep them and the learning environment safe and nurturing. The children must experience dream possibilities through stories, parables, videos, plays, site visits and speakers – drawn from parents, business, sports people, community and government. It is at this point where the understandings of good and kind are further developed. These young learners begin to take more responsibility for their behaviour with some support from teachers and parents. The learners, parents and teachers get to know each others’ learning and communication styles. The parents and teachers are taught how to teach through the various styles with particular focus on the learners. The learners are slowly taught to take ownership for how they learn and to develop their own particular and effective learning methodologies. The children continue to experience possibilities through stories, parables, videos, plays, site visits and speakers – drawn from parents, sports people, business, community and government. They begin to make possible choices – without any pressure from parents or teachers. Dream Weavers are given the opportunity to form their own safe values circles, where they decide how the will interact with each other. This enables them to determine how they will and will not behave with each other. The class teacher is party to the agreement and is expected to behave within the same behavioural agreements as the youngsters. Some of the learners will already be developing and idea of their dreams – and will be able to join dream circles, that focus on their particular area of interests. The learners still have ongoing experience of dream possibilities through stories, parables, videos, plays, site visits and speakers – drawn from parents, business, sports people, community and government. At this point they are involved in projects – such as model building, experiments, robot building, computer program design etc. And they use their skills and the knowledge they have gained on team expeditions, where their dream keepers expose them to the relevance of their lessons. The Dream Catchers, kept safe and interacting through their own peer created and managed values circles, are in now focused Dream Circles. Through the Dream Circles they interact with people with common ideas and purpose, they are mentored by teachers, selected parents, local business people, sports people, community members and government officials. They form shared study groups focusing on their mutual dreams, discoveries and ideas. Past learners, successful business people, sports people and public figures are invited to share their start and how they attained success. They work, play and actually experience their dreams – at the very places that they dream of achieving. Learners with similar dreams joining Dream circles that fit their visions of the future. For example those who focus on becoming medical professionals, may follow the processes defined in this graphic.  Builds ownership, responsibility, motivation and accountability.  Focuses the learning on them and their dreams.  Build generations of happy, professional and successful people who live their dreams and values. The Dream Dynasty Values Circle is a peer created and peer managed values structure which allows all role-players to build the environment required. 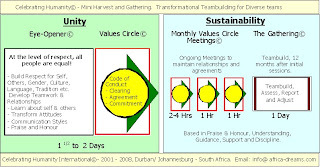 Step 1 – Create an identity, for the class/ grade or Dream Circle that is developing the Values Circle Agreement. 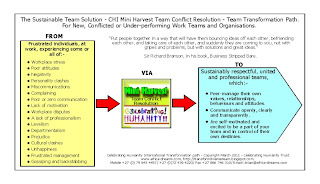 Step 2 – Mutually determine how the group will behave and which behaviours are not acceptable. 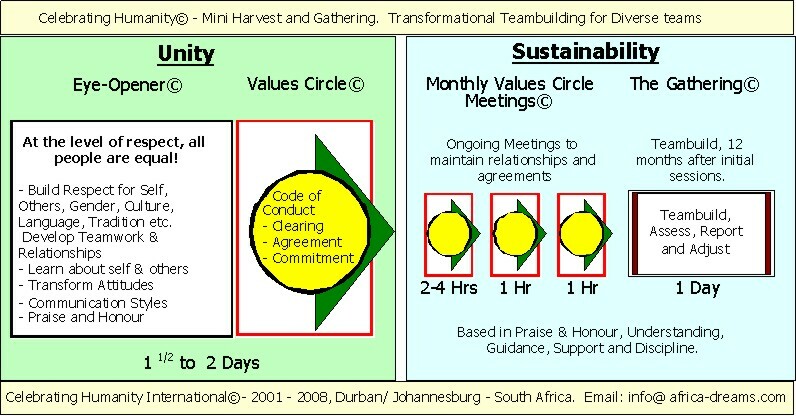 Step 4 – Understand that all role-players are guided and must live by, the rules of the values circle. Step 6 – Clear past interpersonal challenges – face to face. Step 7 – Commit to the agreement and start afresh. Step 8. Peer-manage the behaviours and actions of those who break the rules or who behave in a way that deserves to be honoured – through monthly meetings. Step 9. Refer anyone who continuously breaks the agreements or performs above normal to the Council of Dream Keepers for guidance, discipline or inclusion on the Honours Board. Equipping the role-players with skills. It is of utmost importance to equip learners and teachers, with new and relevant skills – thereby enhancing their long-term ability to learn and share. Thus creating a strong ability to dream and envision great possibilities and focuses. The sooner learners have control over their future, through understanding, skills, ability and their own behaviour management agreement – the sooner they see their own value and become self motivated. Thus teaching them easy-to-learn relationship, learning skills, negotiation skills the better for them in the pursuit of their dreams. The motivation of their teachers and their parents and the future of our nation depend upon us creating a Dream Dynasty. For more on Learning Styles, please go to http://wayswelearn.blogspot.com. 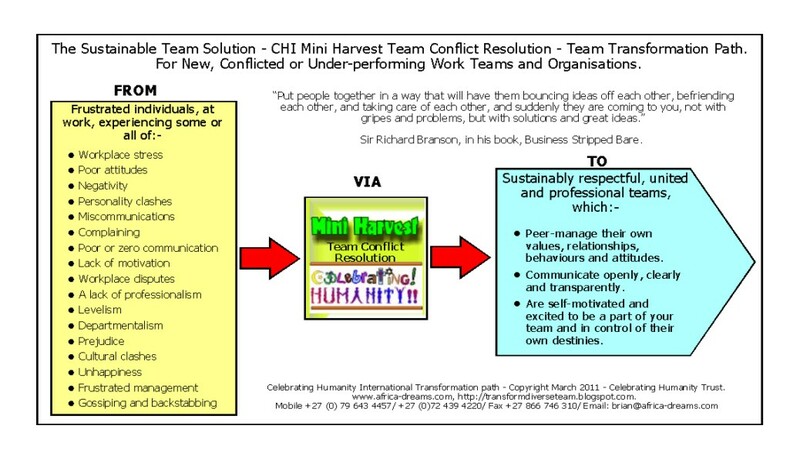 Diversity Management, Team Building and Team Conflict Resolution Specialists.